Go on, give in to your impulses and treat yourself to an indulgent but wholesome biscuit. Creamy yogurt and tangy cranberry are topped off with a sprinkling of pumpkin seeds. Triple Sec is originally a liqueur invented in France, with a flavour of bittersweet orange peels. The "original" Triple Sec is still made today with sun-dried orange peels from Haiti. The word "sec" means dry in French. Featuring a mild orange peel flavour, MONIN Triple Sec Curaçao contains no alcohol and brings great versatility. Use MONIN Triple Sec Curaçao in the bar and beyond. Its mild orange flavour makes it ideal in non-alcoholic applications including lemonades, sodas and even combined with chocolates for an orange scented mocha! Finest Call® Cocktail Mixes are the highest quality, most bartender friendly mixes in the world. The sight of lush green sugarcane fields swaying in the breeze of a faraway Caribbean island is a vision of paradise. Cane sugar is derived from the sugarcane and harvested under the warm sunshine. MONIN is proud to offer MONIN Pure Cane Sugar syrup, a premium simple syrup made from 100% pure cane sugar and filtered water. MONIN Pure Cane Sugar syrup is a great substitute for regular sugar as it dissolves instantly in hot and even in chilled beverages, for incredible versatility in non alcoholic beverages and cocktails alike. Its aromatic power ensures an economic and tasty use. The first to take advantage of the cranberrys unique benefit were Native Americans who believed the cranberry to be a providential gift from mythical giants. The fruit was called cranberry because the flower looked a lot like the head and bill of the cranes. It may have also come about because cranes found it to be one of their favourite foods. Cranberries are used in a wide range of food recipes because of their sweet and tart flavour and pretty colour. MONIN Cranberry offers a perfect balance of the true tartness and sweetness of ripe cranberries. 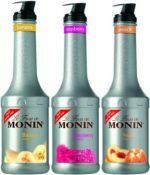 MONIN Cranberry is the easiest way to add authentic cranberry taste to complement your beverages. Guava is an emerging flavour of the tropics, with a pretty pink, sweet flesh and delicious exotic flavour. Capturing the essence and sweetness of the juicy guava fruit, MONIN Guava is a perfect thirst-quencher for those seeking a delicate beverage that is a step above the ordinary. MONIN Guava provides Hawaiian tropical taste in a practical and self-stable product. Make the most of this delicious flavour and use MONIN Guava in all your thirst quenching beverages! Matcha is a special type of green tea: a precious, jewel-green. It is the highest quality tea available in Japan. The tea leaves are hand-picked from various varieties of tea plants, blended to produce the best flavour and stone ground into a fine powder. Matcha has been used for over eight hundred years in Zen Buddhist ceremonies. For the traditional Japanese Tea Ceremony, it is drunk from a single bowl as a sacrament. Green tea is getting more and more popular with the growing awareness of its health benefits, and Matcha is even healthier as leaves are consumed entirely. The high concentration of antioxidants, vitamins, minerals and fibres makes the Matcha one of the healthiest natural beverages. The origins of chocolate stretch back at least four thousand years. The ancient populations of Central America used cocoa beans (Theobroma means food of the gods) to make a hot, frothy and bitter drink called chocolate. This concoction was sacred and was associated with fertility and wisdom. After Christopher Columbus introduced chocolate to Europe, the drink was to become a best seller. In subsequent centuries, it was discovered that cocoa could be mixed with milk and cocoa butter to make what we now know as "chocolate"
Do you know what "to be cool as a cucumber" means? To stay calm, remain relaxed! This is not the only sensation you will feel once you will have tasted MONIN Cucumber .avour. This .avour does not only fit the worldwide natural healthy trend, it also gives you a refreshing and "good for your body" sensation. Even if cucumbers are very popular and available in many countries, cucumber juice is delicate and has a short shelf life. MONIN Cucumber syrup will help professionals save time while maintaining the real fresh cucumber taste. This appealing .avour complies with increasing vegetable trends among mixologists. The gum arabic is a natural gum which is also called gum acacia. It originates from the sap of the Acacia Senegal or the Acacia Seyal trees which are manly cultivated in Africa. The gum arabic is a complex mixture of saccharides and glycoproteins that is perfectly edible. Apart from uses in painting and photography, the gum arabic is used a lot in the food industry as it will give a particular consistency and stability to a product. Many candies are made with gum arabic among which of course chewing gums. MONIN Gum syrup is made of gum arabic and orange blossom. If you are in quest of authenticity and delicacy of taste, you will prefer it to pure cane sugar and enjoy it in similar applications. The blackberry is native to the entire temperate Northern Hemisphere and a very popular flavour in many cultures. The blackberry fruit exists in many varietals which vary in taste from sweet to tart. Blackberries can be found in markets throughout Europe and North America and they are most tasty in late summer. However, thanks to MONIN Blackberry, you can enjoy ripe blackberry flavour all year long.